Portland “loos” are coming to San Diego. 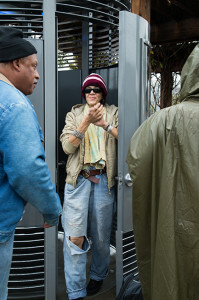 The “inaugural flush” of San Diego’s first Portland Loo was performed at a special ribbon-cutting hosted by Councilmember Marti Emerald Wednesday, Dec. 3 at the southwest corner of 14th and L streets Downtown. The new San Diego-based Portland Loo awaits its unveiling. Originated in Portland, Oregon in 2008, the Loo — a British term for restroom — was the brainchild of City Commissioner Randy Leonard. 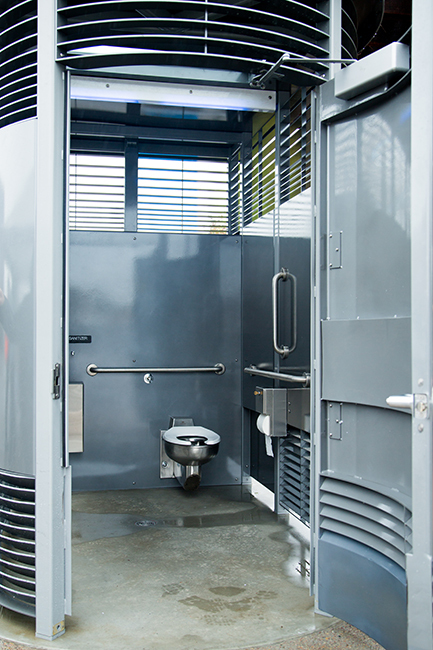 Recognized for their sleek design and efficiency, Portland Loos were created in response to Portland’s rise in homelessness and lack of public restrooms. The Portland Loo is made from heavy stainless steel but is light enough for easy transport. These permanent public flushing restrooms are open year-round, roomy enough to be wheelchair-accessible and can also easily accommodate strollers or a bicycle. Portland Loos have since been exported to other states and Canada, where they received an award as “The Best Public Restroom in Canada” by the Cintas Corporation. 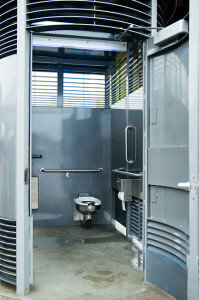 Downtown Portland restrooms, available to the general public at several locations, are cleaned twice daily by a contractor and cost approximately $14,500 a year, per toilet, to maintain. Since 2009, Girls Think Tank (GTT), a San Diego grassroots 501(c)(3) nonprofit committed to advancing basic human dignity for those living on the streets, has been working on providing increased access to 24/7 public restrooms. In June 2010, GTT presented more than 5,000 signatures in support of Portland Loos to the City Council, which unanimously approved funding for the purchase and installation of four identical structures. The same evening as the ribbon cutting ceremony, a “GTT’s First Flush” reception took place at Florent Restaurant in the Gaslamp, to bring awareness to GTT efforts. “Thanks to GTT volunteers and staff from Centre City Development Corporation [now Civic San Diego] who sought input and consensus from Downtown East Village residents and business groups as to appropriate locations, stakeholders agreed on two of the four initial locations Downtown: Park and Market Street, and 14th and L Street,” said GTT spokeswoman Heather Pollock. Pollock noted the statewide budget crisis originally delayed implementation of the Loo project but support renewed last spring. 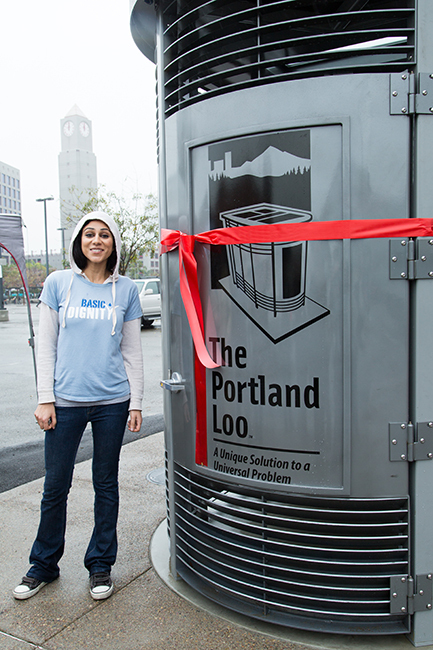 There are several widely held misconceptions about Portland Loos, said Noor Kazmi, past president of GTT and co-chair of its programs committee. Kazmi pointed to the design of the pre-fabricated Loo as the largest contributing factor to its ongoing success. “The fact that the stainless steel is covered with a graffiti-resistant coating prohibits vandals from defacing it and lessens its aesthetic appeal,” she said. Slits at the bottom of the Loo’s structure make it relatively easy for passersby — and especially law enforcement — to detect if more than one person occupies the restroom, Kazmi added, thus deterring illicit activity. The Loos are relatively easy and affordable to maintain and “look great in any urban environment,” Kazmi said. Compared to the bulky, house-like, self-cleaning structures in Seattle, San Francisco and Boston — which can also cost up to $1 million a piece — the Loos are relatively inexpensive. She said the notion of offering public restrooms 24/7 for Downtown San Diego was first presented to GTT by homeless individuals in summer 2009. That happened after word had gotten around that David “The Waterman” Ross, a local homeless advocate, was personally funding several porta-potties for the homeless. In spring 2010, Kazmi said GTT convened the Basic Dignity Coalition to organize people, both housed and unhoused, around the issue. “Volunteers drafted a petition, based on the UN Human Rights Charter, demanding more 24/7 restrooms Downtown,” Kazmi said, adding the Coalition’s Research Committee reviewed the best practices throughout the world. 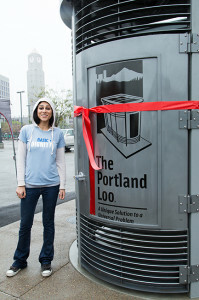 “The committee rested on the Portland Loo, a solar-powered, graffiti-resistant, stainless steel flushing toilet because of its aesthetics, design and affordability,” Kazmi said. Kazmi said there’s no reason to believe the Loos won’t work as well in San Diego as they have in Portland. “With the cooperation of residents, homeless individuals, law enforcement, local business and nonprofit organizations, we don’t anticipate any issues,” she said. For more information about the Loos or Girls Think Tank, visit girlsthinktank.org/programs. …and they’ve been decommissioned in less than 2 years. Now the city is trying to liquidate the shell for $38,000. (won’t happen). GTT should change their name to “Stupid Expensive Ideas”. The clowns running the city should be shot out of a cannon for wasting public funds.